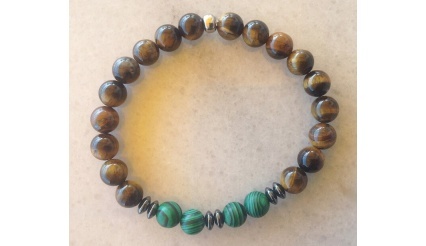 Advanced Energy Infused jewelry for yoga, meditation, magic and esoteric science. HADES Breath Set: Light and Darkness Combined! The Lion’s Gaze Energy Infused Power Bracelet Lava Stone Version Be the Lion The energy infused power bracelet, in contrast to most other of our other bracelets, is geared towards individuals that, on the one hand, want to face their soul’s dark paths head on, while on the other hand, they charged forward as leaders and never as followers; for the ones that go all out for the sake of their dreams, for their glory for their success.In other terms, the Lion’s Gaze Energy Infused Power Bracelet is for the brave and not for the weak.It is for the ones that have decided to either make it or to fall while going for it; no middle ground and no half-backed resolve.In simple terms: it is exclusively made for the King!In regards to the inner path and how the Lion’s Gaze Energy Infused Power Bracelet works, it can be based described with the following parable:“When you throw a stick at a dog the dog chases after the stick. But when you throw a stick at a Lion, something different happens. Instead of chasing after the stick, the Lion chases you, the thrower of the stick.Here the stick thrown signifies a “problem” that arises in our lives, bringing on feelings of annoyance, frustration, anger, and even hostility, as problems often do. By focusing our attention on the problem, we are chasing after the stick like a dog, trying to make the problem go away. This is a mistake. What we don´t realize is that the real problem is not in the physical world, but in the inner world, the world inside us. The problem that appears in the outer world is just a symptom of this deeper, inner problem because the outer world is a mirror-reflection of the inner world.Having the gaze of the Lion means turning our attention inward and looking within ourselves for the real problem. Astraeus is a power energy infused Jewelry set designed specifically for individuals that actively embark in the esoteric path and the occult. Usually Astraeus is purchased by individuals that are active in areas that focus on the stars (astrology, astronomy, tarot and so forth) or by mediums that are active in areas such as: evocation, invocation and rituals. Finally, due to its powerful energy infusion, Astraeus is also actively used for meditations that focus on the dark aspects of things (the ones of you who are advanced in this area understand very well what we are implying here). 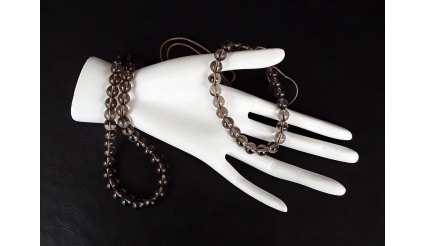 The Complete Set of the Astraeus line: bracelet and necklace.High-end materials were used to create an elegant, beautiful and unique set of 10mm beads.The Astraeus necklace and bracelet combine the power of pure-gemstones namely, the one of Black Onyx (glossy and matte) and of the Tiger’s Eye. 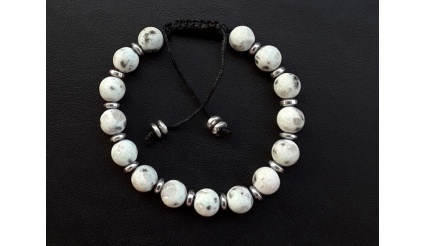 The ending is done with a silver 10mm bead.As with the Titan-God Astraeus, who among other things was also the god of Dusk, so does the bracelet/necklace set combine the colours of Day and Night, the Sun and the Moon.The Astraeus collection comes in a limited edition. 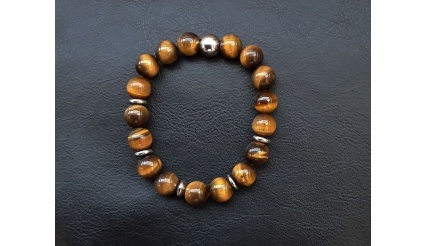 Base Materials:High end gemstones: Black Onyx (glossy and matte), tiger’s eye – with a silver bead ending. 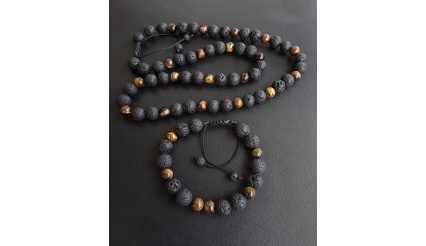 Size of beads: 10mm beads Colours:Gold-Brown, Black, Silver By,DeMar About the Quality of our products:We use high quality materials in our products (i.e. 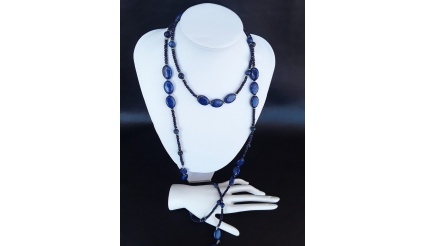 bracelets, necklaces etc) such as a very good grade of genuine natural gemstones and stainless-steel wire and clasps. We always take the time to give you excellent beading and inspection. We keep you in mind as we design our products so the finished product is durable, of a very high quality and beautiful. 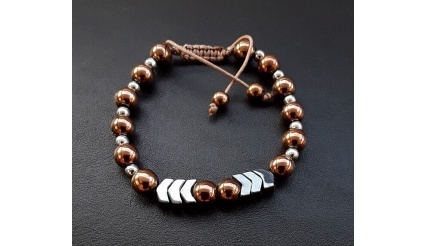 Description:About the bracelet “Orpheus’ Aura”The bracelet Orpheus’ Aura focuses on protection, on healing, on inner peace and balance, on retaining a clear head, on intuition, on creativity, on spiritual well-being and on fighting off stress and negativity. 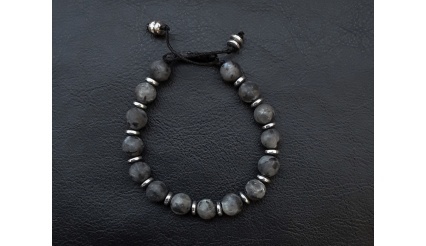 The first thing that you need to know is that:The bracelet Orpheus’ Aura comes in two colours namely, white and black.Who can wear it?Black Colour (power, control, mysterious and protective): Usually, people that are active in the areas of business/corporate area, in the military, in Information Technology, in politics etc. should go for the black colour.White Colour (new beginnings, guidance, wholeness and completion): People that are active in the areas of medicine, of education, of team-sports, in the media etc. 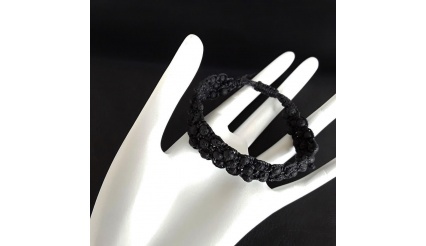 should go for the white bracelet.To the question: if someone can wear both bracelets simultaneously – so as to access the faculties of both bracelets?The answer is: Yes, you can! 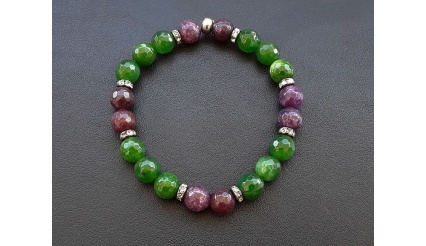 Orpheus’ Aura has been designed around the attributes of Jasper which is throughout connected with the power of Hematite and its faculties.Moreover, for the ones that are aware with the power of numbers, the bracelets Orpheus’ Aura incorporate in them, the powers of: 5, 6 and 7. Finally, and besides energy infusion, Orpheus’s Aura has been created by following the “fractal charm-protection” structure; so as to infuse protective charms. 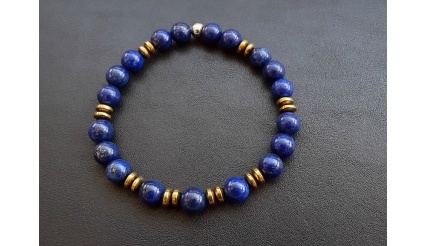 How Orpheus’ Aura will help you:As stated in the beginning, the bracelet Orpheus’ Aura focuses on protection, on healing, on inner peace and balance, on retaining a clear head, on intuition, on creativity, on spiritual well-being and on fighting off stress and negativity. Consequently, Orpheus’ Aura will:Cleanse/purify your vibrational energies,keep you focused and creative,eliminate stress,increase your intuition,focus on your root-chakra and your spiritual-balance,protect you against negativity and negative energies (toxic people included). Plotinus Path – the Bracelet:The bracelet “Plotinus Path” is meant for the seeker, for the person that pursues knowledge, science, hidden truths, understanding and who wants to balance the three aspects of existence, namely: the One, the Form and the Intelligence. “Plotinus Path” is suited for individuals that are active in the areas of: science, education, medizing, religion, occult and esoteric sciences, law, inventions, consulting, business, IT and for people that take upon themselves the roles of leadership and guidance.And for that purpose, “Plotinus Path” has been based on the faculties that the Tiger Eye, the Onyx and the Hematite gemstones bring with them.What is more, the gemstones’ powers have been further increased through specific types of energy infusion and charms.Moreover, “Plotinus Path” bracelet has been designed to be elegant and slick, so that you can wear it with official or unofficial attires. 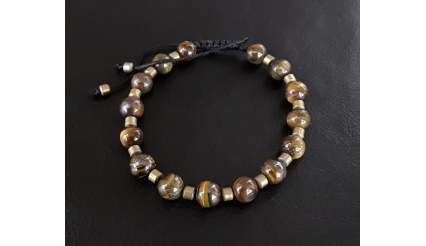 Finally, “Plotinus Path” bracelet uses the attributes of the colours of: gold, black and bronze; and in terms of numeral powers, the numbers of: 2, 3, 4, 6, 7 and 8. 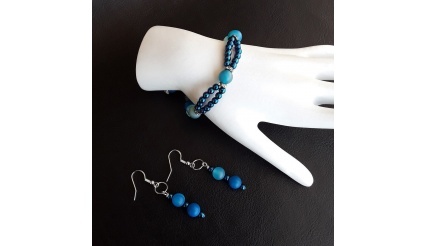 Hades breath set, is a set of a bracelet that is unique in its kind and a necklace that not only is unique in its kind but also it encircles the circle of the first brace-circle. 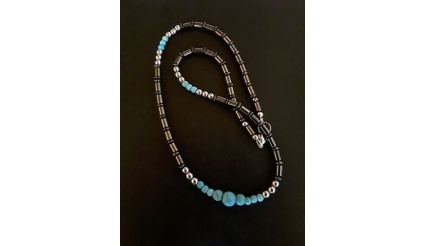 You see, most of our bracelets, and necklaces, are enchanted with energies that focus on protecting you from: negativity, dark energies and dark entities; while allowing you to navigate safely through the astral and etheric planes. On the other hand, Hades Breath is designed to go both ways! To give you a better understanding imagine it like this: Hades Breath utilizes the powers of both a Jedi Master and a Sith Master (making an analogy to Star Wars); consequently, allowing you to use both types of powers. That leads us to the question: who can use Hades Breath? The answer is: both types of Wiccans, both types of Magicians, both types of Occult Scientists and both types of explorers! Side Note: with the term both types, we mean – for example, occult scientists that are walking the path of light as well as occult scientists that have chosen to walk the path of darkness (demonologists included). Aren’t your products designed to support the side of light? However, Hades Breath is one of the few exceptions that is designed to aid the Dark Side as well. Nevertheless, keep in mind that it will not allow, or aid, the Dark Magician to unleash a curse against another person, like Necromancy etc. (here steps in the protection charm of Light)! Let us say that you want to perform an invocation and that you combine both: our orgonites together with our bracelets. If you were to invoke a dark entity (for whatever reasons) – in this case, your invocation would fail miserably because both, the orgonites as well as the other bracelets, and necklaces, would tear that entity apart! Hence, it would never make its appearance! On the other hand, if you would wear Hades Breath, and you know how to do it, then such an invocation would become possible; as a matter of fact, it would boost the entire process for you (but make sure you do not have one of our orgonites around). This leads us to the next question: why would someone want to explore the “dark side” anyway? You see guys, very advanced explorers in these fields of knowledge, inevitably, will sooner or later have to investigate the dark side as well so as to: understand it and learn how it operates. Gaining that type of knowledge, will allow the researcher to effectively, and successfully, fight against the dark forces. For instance: a true exorcist cannot fight against darkness if he/she does not know how darkness operates. Consequently, the exorcist is expected to gain that type of knowledge. And exactly because, sooner or later, explorers of various kinds will have to attain that kind of awareness, hence they will have to step into the other-side, Hades Breath has been created to protect them in this type of endeavour. Hades Breath invokes the powers of 0, 1, 2, 5, 6, 7 and 8. 5 - focuses on expansiveness, restlessness, active, visionary, adventure, the constructive use of freedom, adventurous, mercurial, sensual. From a mystical standpoint Hades Breath combines the powers of light and darkness. Please look at the end of the product description for the additional link that is provided. Black and Gold (for a detailed description follow the link, provided below, to our Official Online Store). 0, 1, 2, 5, 6, 7 and 8 (for a detailed description follow the link, provided below, to our Official Online Store). 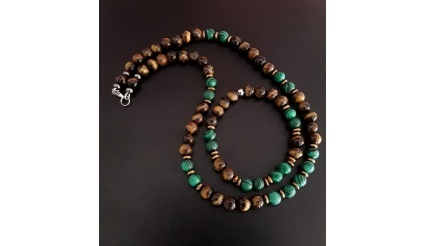 During the entire creation process, protection chants and protection spells are utilized so as to additionally infuse the bracelet’s - and necklace's - gemstones with specific types of energies. Consequently, Hades Breath turns into the absolute protection for you. 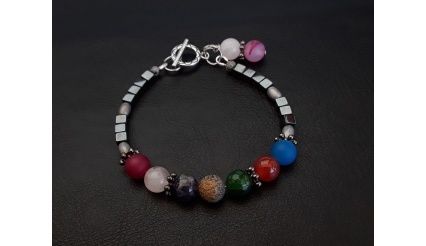 If you want to go completely Overkill against all negativity (etheric and negative astral entities, toxic people, to boost your energies in a significant manner, to influence the Karma of your life and to step into the fields of clairvoyant... combine our bracelets, and our necklaces, with our orgonites and witness it all). Our bracelets, necklaces, jewelry and orgonites are to protect and to support, in their endeavours, people that have not succumbed into the “dark side”. For instance, if you are a toxic person than the spells and charms will turn against you and protect the ones that are meant to be protected by them. The Hades collection comes in a limited edition. 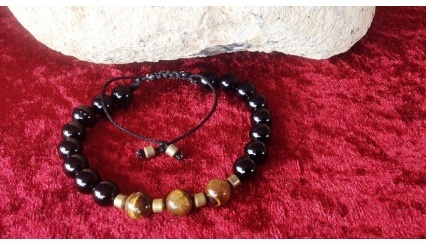 Base Materials:High end: Lava Stones (10 mm) and Tiger’s Eye (8 mm). 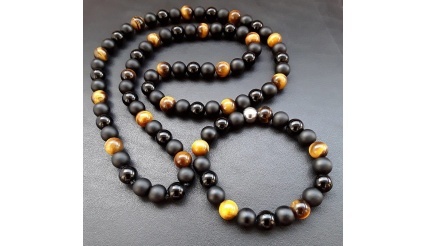 Size of beads: 10mm beads (lava stone) and 8mm beads (tiger’s eye) Colours:Gold-Brown and Black. By,DeMar About the Quality of our products:We use high quality materials in our products (i.e. 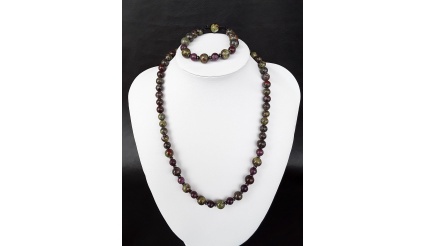 bracelets, necklaces etc) such as a very good grade of genuine natural gemstones and stainless-steel wire and clasps. We always take the time to give you excellent beading and inspection. We keep you in mind as we design our products so the finished product is durable, of a very high quality and beautiful.